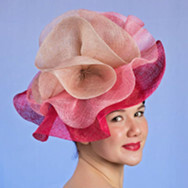 We love our oversized flowers here at the Essential Hat and this one's a real Show Stopper. It's amazing what a piece of sinamay can produce. All materials included in the cost of the workshop. A simple and effective Hoolie Doolie headpiece.